Normally, I share the opinion of many people that you shouldn’t need a special day to tell your parents you love them. And I don’t, not really. However, as) a journalist and b) a procrastinator, I do need deadlines. Some form of schedule telling me when the random thoughts flitting about should be written down in some kind of logical way. Add to this the fact that my new shift (and therefore sleep) pattern means I have hardly spoken to my parents for two months and you get the below, a post about my dad, which happens to fall on Father’s Day, for no reason other than it seems to make sense. I am too young to remember, and my older siblings learn what embarrassment is as my dad waltzes with me through Sheffield City Centre to stop me from crying. I am three, and he picks all of us up at once and I think he is the strongest man in the world. I am four and he lets me wear a spiderman outfit to the supermarket. 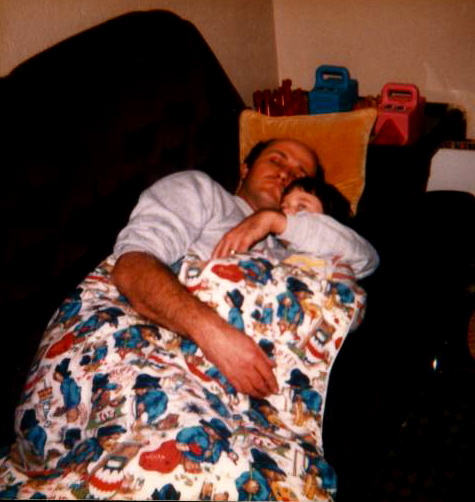 I am five and I curl up in the crook of his legs as he lies on the sofa teaching me the rules of cricket and rugby. I am six and he reads me The Hobbit for the first time and we listen to PG Wodehouse in the car on family holidays. I am eight and he drives me to judo every Saturday morning, a ritual that will last a decade. I am nine and he carries me up the road from where I have fallen, breaking my arm. I am 10 and we drive to Scotland and he does all the regional accents on the way. The same summer he teaches me how to do cryptic crosswords. I am 11 and we begin the University Challenge challenge, a game I have never won. I am 12 and we still watch nature documentaries together, marveling at Attenborough’s world. I am 13, 14, 15, 16 and he drives me all over the country for fencing, waiting in the car or walking the dog because I won’t let him watch me compete. He introduces me to Bob Dylan, the Stones, the Boss, and the Kinks – the soundtrack of our road trips for years to come. I am 18 and he bends the laws of physics to fit all my stuff into the car as I start university. I am 19, 20, 21 and he picks me up at the end of each term, and takes me back in time for pre-season training. We still sing along to Bob Dylan as we drive up and down the motorway. I am 23 and he helps me move into my first flat. He loves the river and the swans that nest outside my window. I am 24 and he helps me buy a house, sitting through mortgage meetings I don’t quite understand. I am 25 and he is confused when people ask if he is worried about me moving to Doha. I am 26 and he fills me with bacon whenever I come home. We watch University Challenge, and do crosswords, and drive to see my nieces and nephew, singing Bob Dylan as we navigate the country. I am 27 and he probably can’t lift all three of us at once anymore, and I have long outgrown the crook of his legs, but he still beats me at University Challenge. Every. Single. Time. …or making a home in a city of hotels. As a result of the latest in a long line of inexplicable visa rules that seem to be controlling my life at the moment, I was given about 48 hours notice to return to the UK. One set of cancelled flights to Beirut, an afternoon of ‘throw stuff at bag, take whatever lands inside’, an eight hour flight, and a drop of 26 degrees later and I found myself wandering around outside Manchester airport at 7.30am trying to find my friend’s car and rapidly losing all feeling in my ungloved hands. I have been back since Friday and will be mooching around my parents’ house until my work visa is finally granted. This will allegedly take 3-5 working days, so I might see the Dohaze again in June. Being back in Sheffield is excellent. There is cricket, a sofa, and a steady stream of cups of tea and bacon sandwiches, but it is always a little strange to come back. I haven’t really lived in my parents’ house since I was about 20. Summers at university were normally spent, at least in part, working in Durham. I did my journalism training in Newcastle and then went to work in Lincoln before hopping on a Qatar Airways flight to Doha for the first time. Having said that, I have never really moved out either. Student accommodation didn’t exactly lend itself to holding an entire life and while the house I own has an attic full of the paraphernalia of my adult life, I did not live in it long enough to make it my home. The remnants of childhood and teenage years are still very present in my Sheffield bedroom. The same posters adorn the walls (Shaolin Monks, Bruce Lee, Star Wars – what else would a teenage girl have on her walls? ), the giant Taz I won at a theme park still sits in a green, high-backed armchair that used to belong to my grandmother, and the werebear I’ve had since I was five is as battered and hugged as I remember, but cleaner, I suspect he has been through the washing machine since I left. As children, my sister and I shared a room, but she was older than me and very neat and I was (and am) one of the messiest humans who ever existed so eventually I was shuftied up into the attic, previously the play room, and the toys we had outgrown were hidden under the eaves. Now those toys litter the floor once more, either to be thrown away (finally) or to be played with when my nieces and nephew come to visit. Swords won at competitions hang from purple-painted beams while questionable teen fashion choices still hang from clothes rails. It is a hotch-potch of my youth, a testament to my ever-changing identity from toddler to teenager, and it is a reminder that I don’t really have a home that displays any part of my adult identity. My house is another couple’s home, and the rest of my adult life has been spent in a dusty city that everyone leaves eventually. All the flats in my building are carbon copies of each other (apart from the ones that are mirror images, which leads to some very confused hangovers when you wake up on a friend’s sofa and can’t work out why there’s a wall where the kitchen should be), and so everyone tries to make little changes, little nods to who they are and how they live. Posters, plants, pots, anything that means you know you are in 2101 and not 2503. We all try to make a home without buying anything that could be a pain to move to a different flat/building/country. Bucking this ‘easy-to-move’ trend, my flatmates came with a piano, a drum kit, and a cat in tow and so our living area has a distinctive feel and the flat does speak of ‘us’ as flatmates, which I like because not everyone has the good fortune to find flatmates who are more than people to share the bills, but are people with whom you end up sharing your life. For me though, apart from some photos, postcards, and a cricket poster, there is nothing in the flat that that makes my feel as though I have stamped my identity on the place in which I live. Part of this is because I moved so much when I first arrived, and as wonderful and welcoming as my flatmates were, I always felt like I was renting a room in their flat rather than actually living there. The new set up is different as we all moved in at the same time and have developed a shared history within the social hub of our living areas. Still, there doesn’t seem any point in buying a lot of stuff when in a month, or a year, or two years, I could be moving house or moving country yet again, no-one wants to store, or ship, or sell a flat worth of furniture and artwork. It might be different, I suppose, if I was with a family, or knew that I would be here for the next six years, let alone the next six months, but right now putting down roots only to have to rip them up again in a year or two, seems like an exercise in futility.